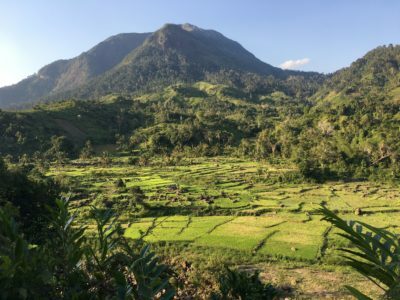 In October 2018, our Co-Founder and Web Specialist, Lynne, visited the SAVA region of northeast Madagascar for two weeks. 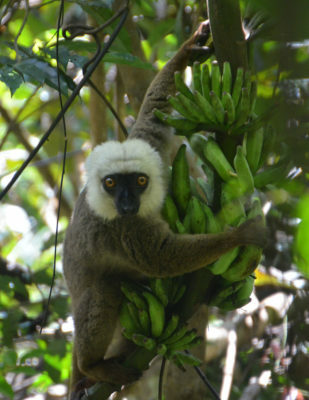 Her goals: 1) hike in Marojejy, 2) see the rare silky sifakas, 3) learn about local reserves in the area, and 4) learn about the Lemur Conservation Foundation (LCF)’s work in this region. 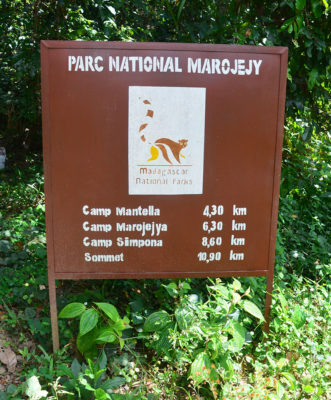 This blog post shares her visit to Marojejy National Park. 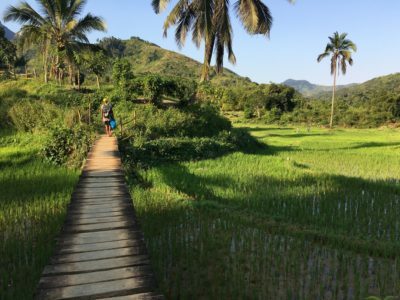 I’ve been to Madagascar twice before, but had not yet been to Marojejy, so I was excited to visit a part of Madagascar that I had not yet seen! When I told a friend based in the area my itinerary, he said, “Do you love walking?”. Indeed, I do! Upon arrival at the Sambava airport, I met with the Lemur Conservation Foundation’s local staff — Joxe and Arnaud — and they helped me arrange my guide, Mosesy, who would be with me for my next few days of hiking in Marojejy National Park. Mosesy and I hop in a taxi and head down the road for a couple of hours to the park entrance. Here, we meet our porters and cook, who had picked up loads of food for our next few days. 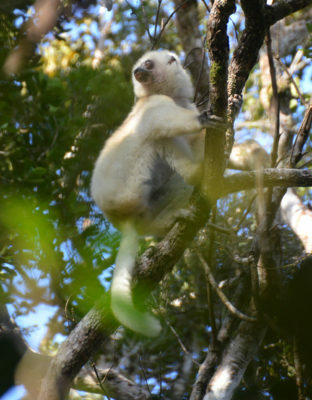 I also hired a simpona tracker, which is a must if you want to see silky sifakas in Marojejy. The range of this species of lemur is quite large, making them difficult to locate. Even with a tracker, there’s no guarantee they will find them. I was lucky, and after hours of dedicated searching by my tracker, guide, and porter, they found a group of two silky sifakas on the forested mountain! I had heard hiking in Marojejy was quite difficult, so I was prepared for an uphill rainforest trek. The hike to the first camp was not too challenging. You begin a few kilometers outside the park at the office, then walk along the road and through fields until you get to the entrance. The walk is green, lush, and gorgeous with a small river on the right and hilly, mountain scenery. Some hills remain forested while many were converted for agriculture. Once inside the national park, you pass streams and dense forest cover, with gorgeous views of the mountains occasionally peering out between the trees. 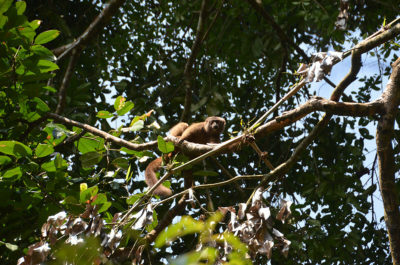 In this first part of the hike, you can see red-fronted brown lemurs, which often travel in groups. We spotted this adorable lemur stopping to nosh on a banana and catch a glimpse of the humans sharing its home for the day. We get to the first camp after dark (we had gotten a late start), and were lucky to spot the eyes of mouse lemurs in the trees just before our arrival! The cooks got to work prepping dinner, and I settled into my cabin after enjoying some hot tea. The cabins are nothing fancy, but they do the trick. Each cabin has two bunk beds and plenty of blankets for chilly nights, and all share a basic toilet and washing facility. The food I ate in Marojejy was the best of my trip — never before have I eaten such delicious, elaborate food during a trek! I had low expectations, because the porters had to carry everything and we were in the middle of the forest after all. But, I enjoyed three course meals, with delicious fresh salads, a main course with a rice or pasta dish, and even dessert every night! The three camps all feature a covered cooking area with pots and all the equipment you need. I was pleasantly surprised that they were happy to accommodate my vegan diet, since I let them know before they went shopping. We start our morning with a short hike to a waterfall near the camp, and then begin the uphill trek to camp two. This second part of the hike was more challenging and uphill, but not too difficult, and the views were great. We reach camp 2 at lunchtime. As I eat and relaxed, my guide Mosesy, along with my simpona tracker and porter, went searching for silky sifakas. The view from Camp 2 is beautiful! My guide and tracker weren’t yet able to find any silky sifakas, so we decid to continue our trek to get to Camp 3 before nightfall. The hike from Camp 2 to 3 is challenging, even more so than I was expecting. I knew it was uphill and steep, but what I didn’t realize was that the elevation gain is so extreme in such a short distance that we would be climbing up tree roots for this entire part of the hike. The weather wasn’t great, so it was a little slippery as well. My arms got much more of a workout than I was expecting, having to pull myself up with branches as we climbed through the forest! We get to Camp 3 just as it started to get dark, and we settled in for the night after a much needed dinner. 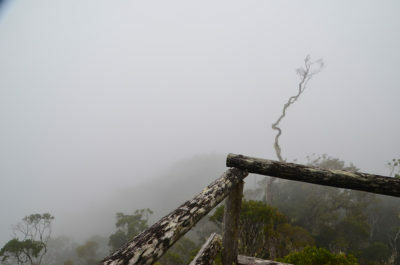 By morning, the weather had gotten worse, and we decided finishing the trek to the summit was ill-advised. To be honest, after the level of difficulty of the hike to Camp 3, I was dreading it anyway! 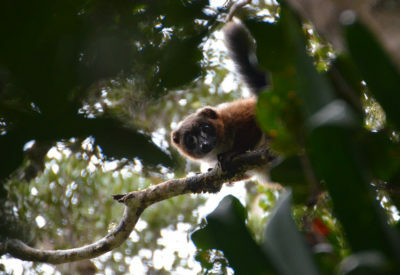 But the hike to Camp 3 was not a wash, since during breakfast, we were lucky to spot two red-bellied lemurs right above us! What a treat! After saying hello to our red-bellied lemur friends, we made our way down the wet mountain, being careful not to impale ourselves on any roots or slip and slide our way down through the forest. We still hadn’t seen any silky sifakas, so our plan was to stop for the night back at Camp 2 again, while my guide and simpona tracker spent the afternoon in search of silkies. A beautiful red-bellied lemur that said hello while we were eating breakfast at Camp 3. View from the lookout going down the mountain from Camp 3 to Camp 2. The weather was not great — I hear this view is gorgeous in good weather! 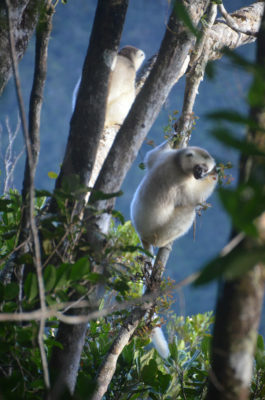 And finally, the tracker finds two silky sifakas! Just in the knick of time before nightfall on our last day, the tracker reports that he has located two silky sifakas up the mountain! The silkies are settling in for the night, so we plan to get up by 5 a.m. the next day and make our way back up the mountain and hope they are still in the same spot. Fingers crossed! Bright and early the next morning, we head back up the mountain to where the tracker spotted the silky sifakas. But this time, we are walking off-trail. (The silkies pay no mind to the actual hiking path.) The hike up is still difficult, but we are determined to get to the silkies’ resting spot before they leave, so we are booking it! The tracker spots them, and we scoot through the forest trying to find a good view without disturbing them. 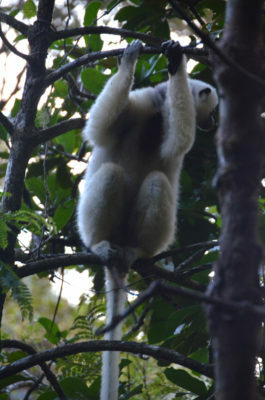 The silky sifakas are beautiful! I am surprised to see that one of them has brown fur on its head, which I’d never seen in photos of silky sifakas. Their faces are beautiful, and their stark white fur is stunning. It’s amazing to see such rare animals just hanging out; they’re not bothered by our presence. It’s heartening to see them in their forest home, and gives me hope that these remarkable lemurs can be saved as long as we protect their forest. After spending time gawking at the silkies, it was time for us to make our descent down the mountain and out of the park. 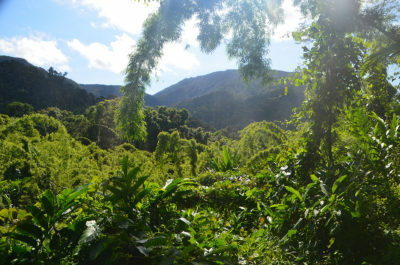 Marojejy is such a beautiful rainforest, and hiking here is truly magnificent. Marojejy is not on every visitor’s itinerary, but it’s well worth the visit, especially if you enjoy hiking. 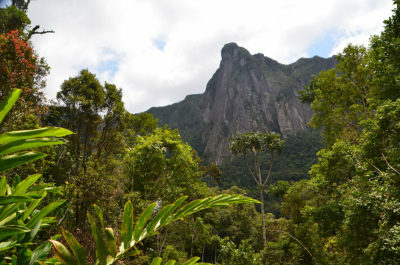 A visit to Marojejy is a great way to see the rainforests of Madagascar without the crowds of Andasibe or Ranomafana. I only saw three other tourists in the three days I was in the park. Daily flights from Antananarivo to Sambava also make this an easy park to access. The hikes to Camp 2 are relatively easy if you are in good shape. 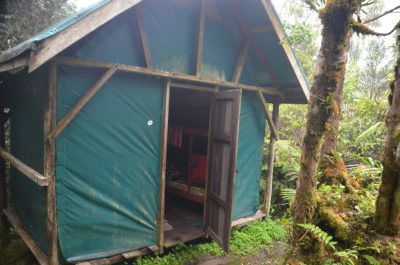 Camp 2 is also the area where silky sifakas can be found, so this is a good base camp if you don’t want to continue on the more strenuous hike to Camp 3 or the summit. Paying for a simpona tracker is highly recommended if you want to find silky sifakas. You can bring and cook your own food using the facilities, but I recommend paying for a cook. The food they prepared was excellent. 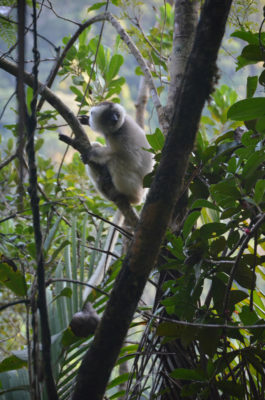 Erik Patel and the Lemur Conservation Foundation are doing excellent work in Marojejy with silky sifakas. Support Lemur Conservation Foundation and learn more about their work on their website. Visit Lemur Conservation Foundation’s profile page on LCN.